Black eyed peas make me think of two things. Well, three really. 2. My grandfather. He passed away many years ago, but I remember going to visit him in Houston when I was a kid. We’d eat at one of two restaurants near his home. I preferred ‘The Black Eyed Pea,’ right on I-10. It’s long gone now, but have fond memories of sharing meals with my grandfather and family there. So it’s a southern tradition to serve black eyed peas for good luck in the new year. And while I don’t really consider myself southern on a regular basis, I definitely think of myself as southern when it comes to celebrating this New Year’s Day tradition. While you could just heat up some black eyed peas straight out of a can and dose them with some salt and pepper, I wouldn’t recommend it. Because that’s boring. And seriously lacking in flavor. Served over brown rice as it’s own dinner, or as a flavorful side dish for your New Year’s Day feast! And HAPPY 2015 to you!!! Stir everything together and bring to boiling. Once boiling, reduce heat to medium and cover tightly with lid. Let cook for about 45 minutes to an hour, or until peas are soft. Season with salt and pepper to taste. Prepare the rice if you are making this as a meal. 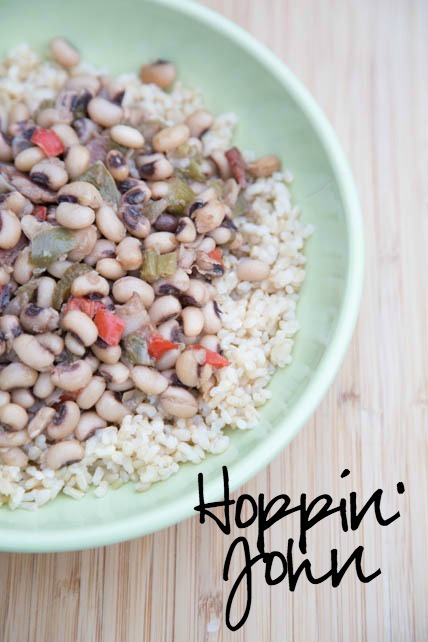 Serve Hoppin’ John as main meal or side dish. 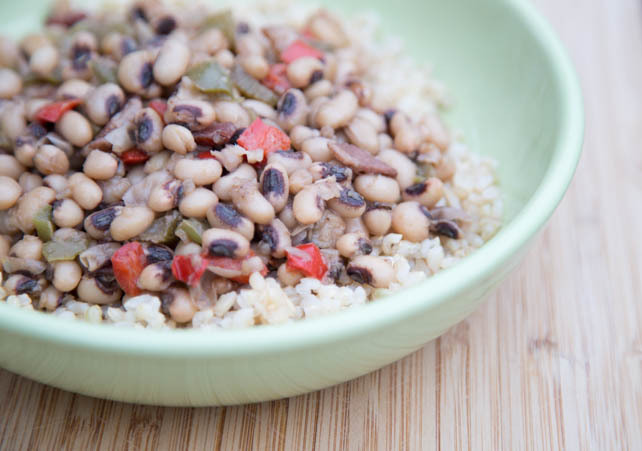 I made these Hoppin John black eye peas , I have to say every year for 20 plus years I try a new recipe! These are the best ever !!! Usually my family chokes down their one spoonful ! They loved these! We reheated them tonight( Saturday) served with sliced Avocado and hot sauce even better ! Yay – so glad you liked them!